Just in time for the parade, my finished "Full House" which I have named "Christmas in the City". My project finished at 41" x 42" and has approximately 423 pieces. The fabric is Countdown to Christmas by Sweetwater. 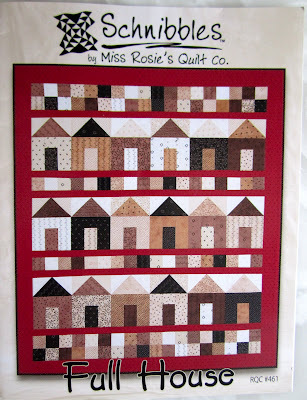 The pattern is Full House by Carrie Nelson for Miss Rosie's Quilt Co. This is Lifetime Quilt #79 and my second finish for 2012. My first two projects of the year have a total of approximately 1.422 pieces. The roof is a 2 1/2" x 4 1/2" - For the roof cut a 5 1/2" square diagonally twice use one piece- for the sky cut a 3 1/4" square diagonally once, use both pieces. Trim to correct size. Siding - black dot print in picture - cut three 1 1/2" x 4 1/2" pieces, one 3" x 1 1/2" piece, three 1 1/2" x 1 3/4" pieces, and five 1" x 1 3/4" pieces. 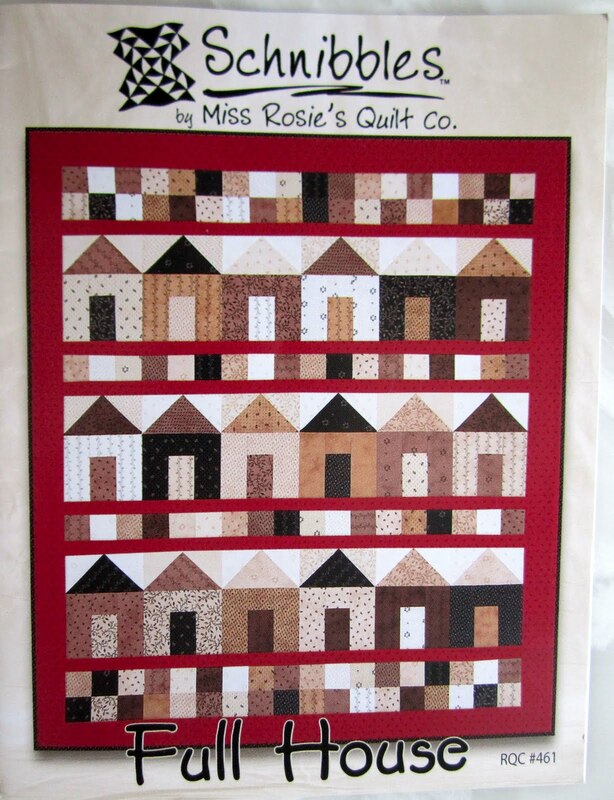 Once all the pieces are correctly sewn together you get a town house that is 4 1/2" wide x 10 1/4" long. Someone left a comment saying that my town houses reminded them of Meg Ryan's town house in the movie "You've Got Mail", one of my all time favorite movies. I bet I've watched that movie nearly 50 times. No wonder I thought I needed some town houses! 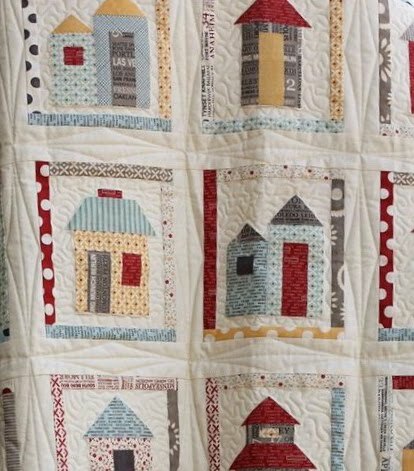 Additional Note on Sweetwater's "The Neighborhood" pattern - I just received the pattern in the mail, those cute little cottages are appliqued! I thought they were pieced. I'm not in the mood for an applique project now but am thinking maybe I can convert the applique patterns into pieced patterns, stay tuned for further updates! Melinda at Melinda Quilts has made the pattern and said the applique wasn't that hard, she machine applied her cottages. Click here for a looksie. I got my town houses done . . . I just loved the look of the snowflake print on the roofs of my town houses so that's what I went with for all of them. And my Carrie houses are done too. . . I decided to mix up the roofs on these houses. This pattern is gong together very quickly, even with my small adjustment. I think you still have time to make this pattern and join in on Sherri and Sinta's Full House parade, even if you haven't started yet! I think I like the looks of this Sweetwater pattern called "The Neighborhood", it has a summer beach town feel to it. I've noticed that there is still plenty of Hometown by Sweetwater for Moda fabric available, and several online stores have it marked down. There's something to be said for being the last one to jump on a bandwagon! James River Blues is home from the quilter . 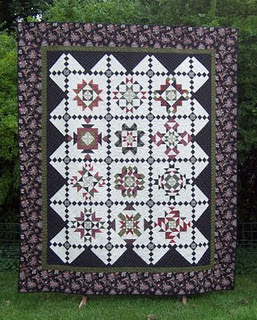 . .
Connie Lancaster at Quilts Plus quilted this top for me. This quilt was originally headed to the family room, but my red couch was bare after I put up my Christmas quilts so it landed here instead. If you've ever wondered what color couch is the best color to showcase your different quilts, it's been my experience that red couches are the best! I've just got to share this with somebody, and since no bodies are coming to my house you get the news . . .
Not only is my $4.99 Home Depot Poinsettia still alive, it looks better today than when I brought it home over 6 weeks ago! Leaves continue to open and bloom. I've never managed to keep a plant alive this long, let alone thriving! It's the only thing blooming in my neck of the woods, at this rate, I think it may make it to next Christmas or at least Valentines Day! I'm also sewing, hopefully the weather will cooperate so I can get some good pictures of Starry Eyed, it's all done! 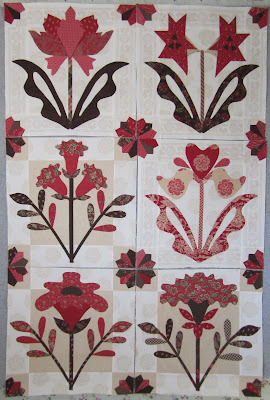 It's been months, several months, FIVE months, Five months and a day to be exact, since I blogged about Evening Bloom, my needle turn applique project by Blackbird Designs. Somehow, I got off track last fall, I started block 6 but just didn't get much past the starting point. After so many months of not stitching I was worried my stitches would be back to beginner level, but I hadn't completely lost my touch, it feels great to be back at it, and here goes . . . .
Ta da, Block 6, all done, FINALLY! I think it's my favorite block!! Here are all 6 finished blocks, since I'm sure you've forgotten what they look like, I know I almost had. Only 3 more blocks to go! Christmas came and went far too quickly for me. It seems like I just got all my before Christmas To Dos done and now it's time for my after Christmas To Dos. I was hardly home to enjoy my decorations and wasn't even tired of them, but I packed them all up just the same. Someone PLEASE remind to get an earlier jump on Christmas for 2012, a reminder note after Labor Day would be much appreciated! Time to move on. Well not totally on. Back in July, when that Countdown to Christmas fabric by Sweetwater for Moda came out, I got all excited and started counting down to when I would make something out of that fabric. Then this free pattern showed up on the Moda Bakeshop website and not only did I have my Countdown to Christmas fat quarter bundle I had my pattern. Here's a nice closeup view of Angela from Fussy Cut's Starry Eyed. But I like to work with Christmas fabric when it's Christmas. So I just sat my fat quarter bundle on my shelf, printed the pattern, and started counting down to Christmas. Well a funny thing happened on the way to Christmas, I got busy, but after waiting 6 months to make this quilt I decided I wasn't going to let a little matter of Christmas being over stop me, that's the thing about Christmas, it will be back, and I'll have a new quilt when it is. So my daughter went back to California, my husband went back to work and Cooper went back to daycare. What's a girl to do but get back into her sewing room. And I did. Here are my inspiration blocks. They could not have gone together any easier, I think this will be a fun and fast project. Angela's Starry Eyed quit finished at 64" x 80", four 16 inch blocks wide by five 16 inch blocks long. This quilt is going on my guest room bed and needs to be a little bigger than Angela's finished quilt. I decided to go with 5 blocks wide by 5 blocks long, but still came up a little short so I'm making my blocks 18 inches square which will give me a finished quilt of 90" x 90", just right I think. 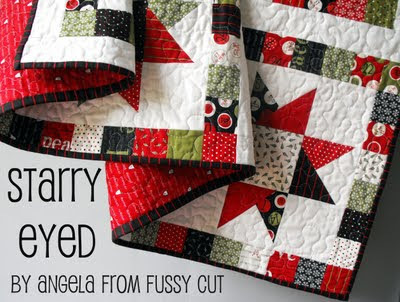 I've cut the entire quilt out and pretty much used up that entire fat quarter bundle! Nothing left to do now but sew.